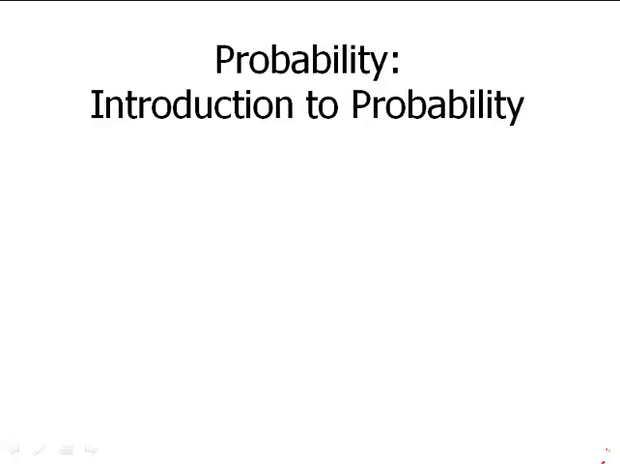 This is the first video in the probability module. Probability is a tricky topic for a few reasons, not least of which is because many people have all kinds of misconceptions about probability. So let's start this out very slowly. What is a probability? A probability fundamentally is a ratio, that is to say a fraction. It is the fraction of the total number of successes over the total number of outcomes. So of all the trials that you make how many of them result in a quote, unquote success? And here we're using the word success awfully broadly. For example, we're counting the number of heads when we flip coins, we're counting a head as a success. We're not talking about success in the great life fulfilment sense, just success in the very limited sense that we're getting the result we're looking for. Now notice. That probability has to be between 1 or 0. It could be 1 or 0 or somewhere between, but it can't be outside of that range. And in particular, if the probability is 0, that means the number of successes is 0. That means no matter how many times you try you're gonna get 0 successes. So, in other words, this means that the probability of success is impossible. That's what a probability of 0 means, that something is impossible. By contrast, if something has a probability of 1, that means the numerator and the denominator are equal. That means every single time you have a trial, every single time you get any kind of outcome, that outcome is a success. So success happens ever single time. And so this means that success is certain. So probability of 0 means something is impossible. Probability of 1 means you are dealing with absolute certainty. Obviously most interesting real world probabilities are not 0 or 1, they're somewhere in between. So, a very simple example of a calculation, this is far more simple that something you'd see on the test. What is the probability that a month name has an R in it? And so, a very easy way to think about this. We'll just make a list. And here are all the month names in English. So, we'll just look for the ones that have an R in it. So, we notice some Rs there, some Rs at the end here, and it turns out we found 8 month names that have an R in it. So, 8 over 12, and of course with any ratio, with any fraction we always put it in lowest terms. Cancel the 4. So, the probability that a month name has an R in it is 2 3rds. So here we were just able to list the possibilities, and then make our ratio from this list. Now, again, this is a very simple question. There's going to be nothing on the test where you're going to be able to list all the possibilities. In general listing is not going to be the most effective way to solve the problem, and we'll talk about other solutions. But I'll point out that often making a list is a good way to get yourself acquainted with the material. Get yourself acquainted with the types of things that the problem is asking about. We'll talk about this more later. So, listing is not necessarily a solution strategy, but a way, sometimes, to understand the scenario. Another important word to understand in the study of probability is the word random. Now this is a word that has many misconceptions in every day life, people think that random means completely haphazard and unpredictable, and that's part of the story, but that's not the whole story. Random means two things in mathematics, random has this very specific definition. One, every individual event is absolutely unpredictable. And two, the overall pattern of events is completely predictable. That is what happens when something is truly mathematically random. So for example, if I flip a coin. Any individual time I flip a coin, I might get heads, I might get tails, and there's no way to tell before I flip the coin exactly what's gonna happen. It's completely unpredictable from one time to the next. Even if I get five coins in a row, five heads in a row, the probability of a head or tail on the next throw is still just one half, it's still entirely unpredictable. In that sense each individual flip in unpredictable, but if I were to take the time, say to flip a coin 1,000 times and log all those results. I would be guaranteed that the number of heads and the number of tails would be very, very close to 50/50. In other words, it would be unlikely to be further from say 490 or 510. It would something very, very close to 500 of each. And so that's the pattern that is guaranteed, and in fact the more I flip the coin, the larger the number of flips, the closer the ratio would have to be to one half, and so that is the meaning of random. Very important to keep both of those in mind, individually unpredictable, but over the long term completely predictable. So, in summary probability is a ratio, a fraction, somewhere from 0 to 1. It can be as small as 0 or as large as 1. If you can list all the possibilities, that's great, then simply count. And again, making a list is not gonna to be our only strategy. We're gonna talk about many more strategies in these videos, but this the most elementary of all strategies, making a list. In the next videos, we'll learn some more general, abstract rules for probability.